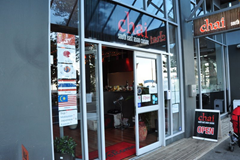 Chai, South East Asian Cuisine, restaurant is located in a beautiful area of Napier, facing the ocean. 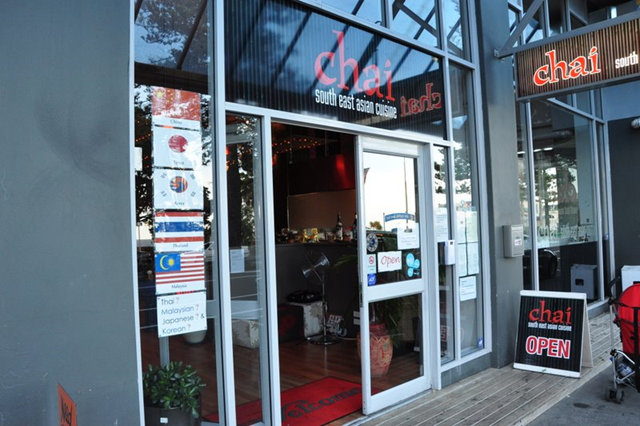 They serve a mix of different Asian food. There is a nice ambience, with candles and an aquarium mounted on the wall. 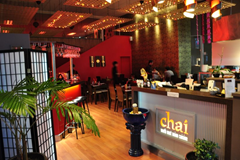 The service was very friendly and we felt comfortable eating there with our daughter. The staff made us feel very welcome. We started with the Teriyaki Tofu, $11NZD. It’s listed on the menu as a vegetarian option, which it is, however it’s really an appetizer size. It was served with ginger and spring onions and was excellent. 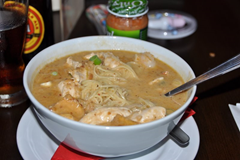 Ian had the Laksa, $18NZD. It was a soup made with a medley of chicken, tofu, and shrimp along with mildly spiced noodles. Very enjoyable! Wendy had the Shitake Mushrooms. They were crispy but also salty and rather heavily battered and fried. It was a large plate and it was served very hot, but by the end it was a bit much. Overall, we enjoyed our dinner.